Stylish, modern, open, family and environmental friendly house dressed in wood has been designed by Archi-cubes, an Architect Design Firm based in Main MM. Alam road, having the Best Architects in Lahore. The architectural design and the design of the interior and exterior has been designed to meet the needs of the whole family. This is a home with efficient space organization, with large living and community spaces that are open to the garden and protected terraces. The home was designed with the utmost openness despite the climate of the site. The philosophy has shaped the modern house, looking for the perfect balance between light, spaces and interior / exterior relationships. The material palette contains warm shades, natural surfaces with structural elements like wood and brick. The choice of materials is successfully assembled into a unit that simultaneously demonstrates the unique character and simplicity of the design. In the interior, these contrasts with natural textiles and vibrant colors are a pleasant contrast. 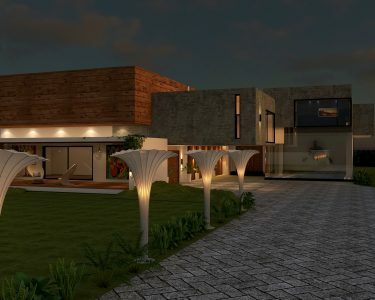 Concrete, wood and stone are a great combination of a modern building which, despite the concrete structure and two blocks of cantilevers with crude concrete walls, does not have the rustic bush of secluded house. 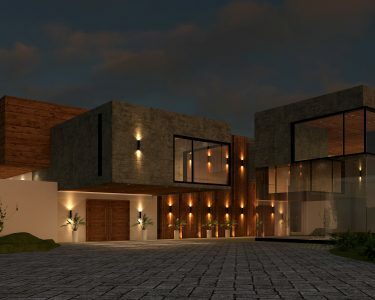 The interior design was also carried by Archi-cubes, known among the Best Interior Designer in Lahore, with the goal of creating an elegant, comfortable home, in which the family can feel the time-honored design years later. Different elements – natural materials, wood, glass, stone, textiles – have been combined with the combination of colors and materials with vibrant shades in a homely minimal style. The large floor area of 10,000 square feet made it easy for a family to reach a convenient distribution: the rooms of this house are organized on practically two sides – in the middle with the hallway, kitchen and connecting to a huge patio. On one side there is a combined double heighted living room, dining room and a study room, on the other side the parents’ master bedroomand children’s room. On the first floor we have bridges leading to the bedrooms for guests connecting to a spacious terrace. Classic and modern elements can be found in style, this game adds contrast to the decoration.